For garden-lovers and those who just enjoy the vistas of the classic Tuscan countryside, an afternoon touring the gardens of the famed La Foce estate, two hours south of Florence, provides the impetus for many that brings them back to stay in one of the many renovated farm houses or even in the villa once occupied by the author Iris Origo. La Foce lies on the hills overlooking the Val d’Orcia, a beautiful valley in southern Tuscany. Midway between Florence and Rome, it is also within easy reach of Siena, Arezzo, Perugia, Assisi, Orvieto. From Etruscan times (a burial-place dating from the 7th century BC to the 2nd AD has been recently excavated on the property), the settlement of La Foce has been continuously inhabited for many centuries. In medieval times, ts strategic position on the historical Via Francigena leading to Rome greatly increased its significance. The Villa itself (now available for rent) was built in the late 15th century as a hostel for pilgrims and merchants traveling on this busy road. In 1924 the clay-covered hills were bought by Antonio and Iris Origo, who dedicated their lives to bringing progress and social change to the then poverty-ridden area, building a profitable farm on the enormous property. Today the estate – a combination of woods, cultivated fields and olive groves – is run by the Origo daughters, Benedetta and Donata. The garden, is an ideal combination between the landscape and 20th century architecture, blending Italian and English traditions and taste. 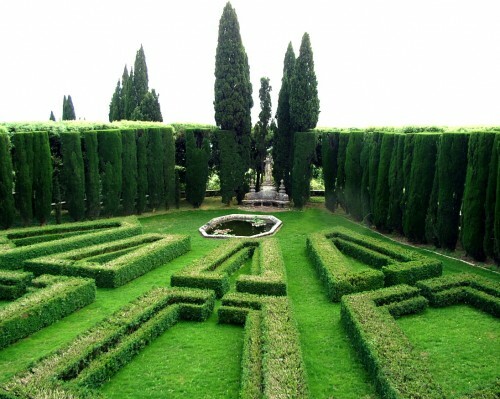 The Origos engaged an English architect, Cecil Pinsent, who had previously done extensive work on Bernard Berenson’s Villa I Tatti in Florence, to restructure the main buildings and create a large garden at La Foce. 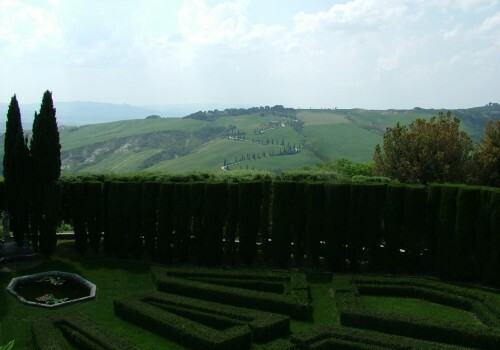 The vast garden was conceived to enhance the Renaissance house and expand the spectacular view over the valley of the Orcia and the Amiata mountain. The harmony between buildings, garden and nature makes La Foce an ideal example of Tuscany’s architectural and cultural evolution. 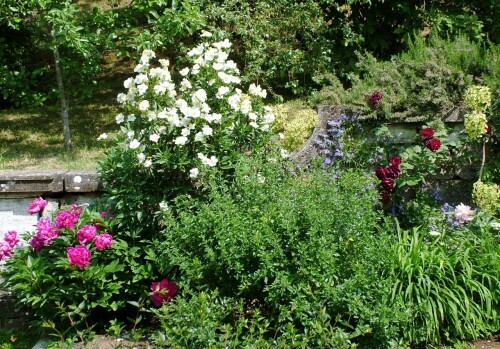 The garden grew gradually, between 1925 and 1939. The villa is surrounded by a formal Italian garden, which is divided into geometrical ‘rooms’ by box hedges with lemon trees in terracotta pots. Travertine stairs lead to the rose garden and a winding wisteria-covered pergola bordered by lavender hedge. Gentle informal terraces climb up the hill, where cherry trees, pines and cypresses grow among wild broom, thyme and rosemary, and a long cypress avenue leads to a 17th-century stone statue. 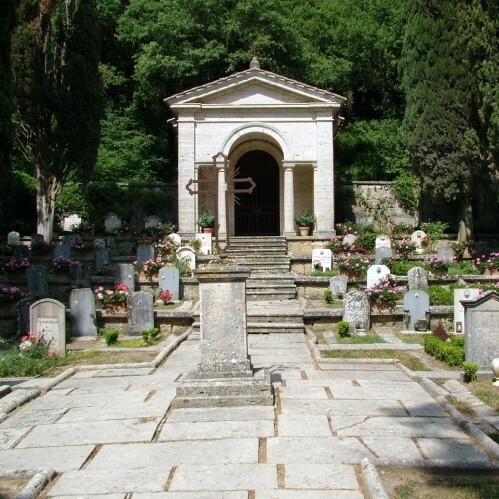 Through the wood, a path joins the garden and the family cemetery, considered one of Pinsent’s best creations. 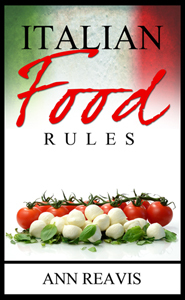 Near La Foce, are the Renaissance and medieval towns of Pienza, Montepulciano, Monticchiello and Montalcino. The countryside abounds in lovely walks among woods and the characteristic crete senesi (clay hills) and famous wines such as the Vino Nobile and Brunello can be tasted in the local cellars or accompanying the delicious southern Tuscan cuisine. Opening hours: the garden is open to the public every Wednesday afternoon. 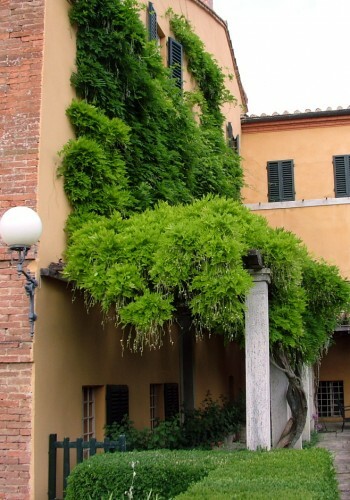 Guided tours leave from the Fattoria courtyard every hour from 3 to 7 PM (April-September) and 3 to 5 PM (October-March). For more information about the gardens and the vacation rentals on the estate see the La Foce website.